It’s been a crazy week here. We have a 2004 car that I really love and am not ready to depart with, so Kurt and I have decided to have its’ engine replaced. It’s a great little car and because it’s been in Arizona most of its’ life, the body is great condition with no rust. We figure at this point even though it’s a hefty some of money to do that, it’ll be less expensive than purchasing a new car. Have you owned a car that you weren’t ready to part with? Also, my laptop has been driving me nuts, saying there’s no more space. UGH!! All of these mechanical and technological machines are pretty darn wonderful until we start having issues with them. I just don’t have the patience when something’s not working. It drives me bonkers. Because of the low memory in my computer I’ve been having trouble saving pictures for my posts which is why you haven’t seen me put much up this week. So, I’ll be ordering a new laptop next week. I’m excited as I always love opening the box and making it my own. Our son, Cameron is running his second half marathon tomorrow morning. Our temps. are supposed to be in the mid 80’s this weekend while I hear New England is expecting 6 inches or so of snow! No, thank you. Reminds me of when we had a huge snowstorm in Rhode Island in the beginning of April 20 years ago. Not fun. 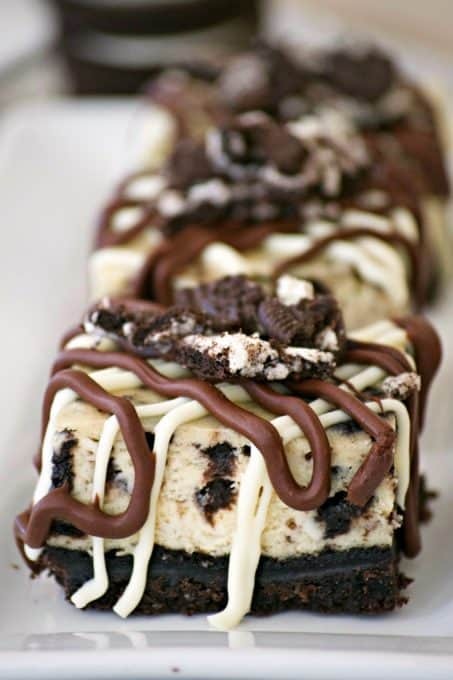 These Cookies and Cream Cheesecake Bars remind me of this Oreo Cake, my Oreo Pudding Dream Bars, and these Chocolate Chip Oreo Cookies. an 8 X 8-inch glass baking dish or if you want to double the recipe, use a 9 X 13-inch baking dish, so you have plenty to share with friends. Be sure to use a food processor to crush those Oreos into fine crumbs. It will make the process a whole lot easier for you. 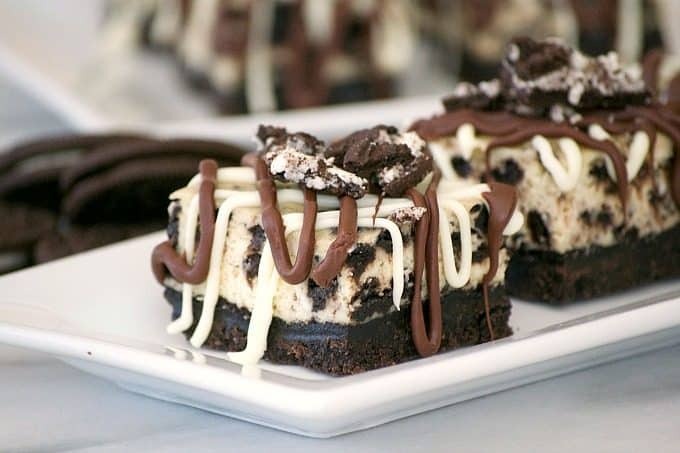 Everyone will love these Cookies and Cream Cheesecake Bars with their Oreo cookie crust, cookies and cream cheesecake layer and drizzled with chocolate. Preheat oven to 325 degrees F. and line an 8 X 8-inch baking pan with tin foil. Lightly spray the foil with cooking spray. Place 24 complete Oreos in the food processor or blender to turn into a fine crumb. In a medium bowl, mix the Oreo crumbs with the melted butter until well combined. Pour into the prepared baking dish and press down to evenly distribute. Place into the oven to bake for 10 minutes. In a mixing bowl, beat the cream cheese until smooth about two minutes. Add the sugar, salt and Greek yogurt, and mix well. Make sure to scrape down the sides of the bowl. Beat in the egg, egg yolk and vanilla. Reserving 3 Oreos, place the rest into a sealed plastic bag and crush. Fold into the cheesecake mixture. Gently pour the cheesecake batter over the crust and smooth with an offset spatula. Place into the oven and bake for 35 - 40 minutes or until center is barely wobbly and edges are set and very slightly golden. Allow to cool on a wire rack and then transfer to the refrigerator to chill for at least two hours. Place the 3 saved Oreos into a plastic sandwich bag and crush into small pieces. Lift the tin foil from the pan and place onto a cutting board to slice with a large knife. Place the chocolate chips and white chocolate chips into two separate microwavable bowls. Heat for 30 second intervals, stirring in between until chips are melted and smooth. Pour each into a plastic sandwich bag and cut a small tip off of one corner. 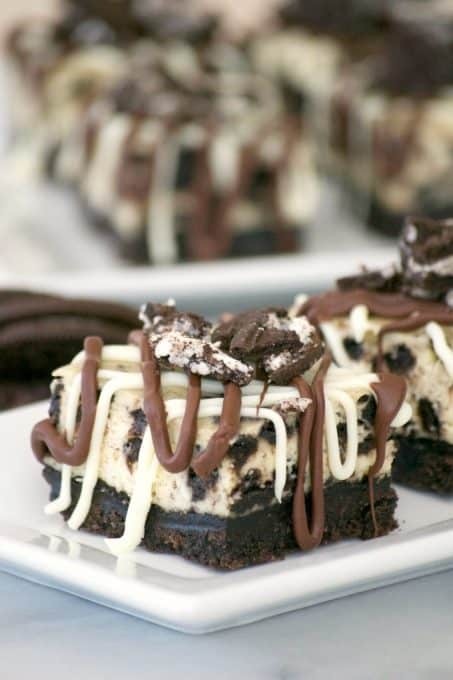 Drizzle the chocolate over each of the bars, and top with the remaining crushed Oreos. I give you BIG baking hugs and muffins!!! Here in Ohio, we have been getting the lake effect snow, with wind chills in the single digits tonight. Tomorrow, more of the same. 🙂 These cheesecake bars look yummy! How early can this be made ahead of time? I wouldn’t go more than a day or two day ahead of time, two at the most just to make sure they’re at their freshest. Hope you like them! Do you think I could use your recipe to make them into cupcakes? Lucy, you could try. I’m not sure how they would work as I haven’t done it. 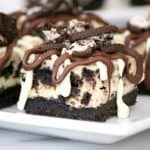 I would feel better sending you to this recipe from Tessa at Handle the Heat for her Cookies and Cream Cheesecake Cupcakes. Enjoy! How many oreos do you get in ‘one package’? Here in the UK we only get 14 – I’m wondering how many I will need. Thanks! Vanessa, the packages we get here for our regular Oreos contain about 28, so you’ll definitely want 2 packs. You’ll need to crush 24 full cookies for the crust and then crumble the remaining ones to decorate the top. Hope that helps! I made these and they were absolutely delicious! Doubled the recipie and I’m glad I did -they went like crazy. I substituted white chocolate drizzle for melted peanut butter chips, it was delicious! Will be usuing this often, thank you! Oh, Nicole, thank you so much for letting me know. I’m so glad you like them and it sounds as if others did as well. I love the idea of the melted peanut butter, too! I’ll definitely be trying that next time. Hello, can you explain how you melted the peanut butter cups? Then did you just drizzle the liquid iver the bars and it hardened a bit? Would double stuffed cookies work Ok? Don, I apologize for my delayed reply. I’ve been traveling with unreliable internet. Double-Stuffed Oreos would work. And you are right, 12 cookies would not be enough for both the filling and to place on top. You’ll want at least 6, if not 8 Oreos to crush and put on the top. I’d say crush up 10 to 12 cookies for the cheesecake filling. You don’t want too little or too many cookies inside, but you do want a sufficient amount for flavor. I hope that helps, Don! Also, how many cookies should go into the cream cheese mixture? The have 2 packages that contain 30 double stuffed cookies each. I’m planning on doubling the recipe so that means 48 cookies in the crust. Leaving 12 cookies to be divided between the cream cheese mix and the topping… That doesn’t seem like enough. Am I just confused or should I get more cookies?